Online MBCT provides a very effective approach to overcoming anxiety, depression, OCD and also PTSD. Please contact me if you would like to explore more how this approach could help you. Nobody wants or expects to be faced with mental illness. It has many faces. Depression, anxiety, OCD, PTSD, chronic stress—mental illness is real and persistent, lasting from months to years, and can upend lives and relationships. Chances are, you know someone who is experiencing a mental health challenge right now. Maybe you’re struggling. In any given year 1 in 5 adults will…that’s 43.8 million people in the US. When you or someone you care about is facing mental illness, it’s important to get help. And a part of the road to recovery is learning the skills and tools to cope with whatever challenges you’ve come up against. One way to learn those skills is through Mindfulness-Based Cognitive Therapy. MBCT for short. MBCT is an effective and proven treatment for mental illness. It gives you an empowering framework for facing and understanding how mental illness affects you. In my online mindfulness therapy practice, I use MBCT and other therapies to help my clients get back to enjoying their lives. So, let’s take a look at MBCT and how it could change your life, and/or the lives of the people you care about. Welcome. My name is Peter Strong. I’m a professional online therapist and I offer psychotherapy via Skype that is based on Mindfulness Therapy. I offer online MBCT or mindfulness-based cognitive therapy. The style of therapy that I’ve developed is called Mindfulness Therapy which is based on and MBCT but it takes it a step further. So mindfulness is a very effective tool that is having tremendous impact on psychotherapy and on wellness in general. It’s a way of developing a conscious awareness of what’s happening in the mind and establishing a relationship that is non-reactive with whatever thoughts or emotions arise in the mind. So we can see it thought, we can become aware of it, but not become identified with it or become reactive toward the thought with grasping or aversion. So we can hold thoughts and emotions in our awareness without becoming overwhelmed by them. And that’s the primary contribution of mindfulness. The CBT version takes this a stage further and then begins to help you evaluate these thoughts and judge if they are rational or not. Most of the time we blindly accept generalizations and black and white thinking and so on, that are not really real. They just become thought patterns that we become attached to and that can create problems. Rumination in depression is an example of that. Catastrophizing and excessive worrying are big factors in anxiety as well, or OCD. So challenging the thoughts and then of course trying to replace them with more positive and functional thoughts is the primary objective of CBT. Mindfulness is about not becoming seduced if you like by reactive thoughts and CBT is about looking at how to change those thought patterns to more positive ones. Now, Mindfulness Therapy which takes MBCT to a stage further looks ar another very important factor that sometimes is overlooked, and that is the emotional charge of thoughts, the emotion itself. So many intrusive thoughts, particularly in depression and anxiety and OCD, have a very strong emotional charges. It’s very difficult to simply dismiss those thoughts because they are so intense emotionally. So working with that emotional charge is the main contribution of Mindfulness Therapy. This is a system that I have been working on for over 20 years now. So the same kind of ideas apply. We first of all cultivate mindfulness, which means recognizing those emotionally charged thoughts, but then establishing a relationship based on mindfulness, non-reactivity with those thoughts, but then looking at a response to those thoughts that can help them heal effectively. So mindfulness therapy is very focused on healing. So what is it about that thought that has such an intense emotional charge that keeps it there. It is clearly stuck, essentially, and we need to help free that thought of that emotional charge in order for it to resolve and go away. So that involves establishing another aspect of mindfulness which is called metta, m.e.t.t.a, in Buddhism. This is a quality of friendliness or loving kindness or compassion. We need to develop a compassionate relationship with our emotions if they are to heal and that’s a very, very important part of Mindfulness Therapy. It is developing this internal compassion towards our own emotions and thoughts. If we can hold them in in this way and help them heal by our compassion and our friendliness and our interest in their welfare then those emotions will heal. And when the emotions heal then that takes away the emotional charge of those intrusive thoughts and they tend to dissipate and quite naturally become replaced by more positive thoughts because there’s nothing keeping them there. They are no longer stuck in the mind. So this is a brief overview of Mindfulness Therapy and online MBCT. If you’d like to learn more do please go to my website and reach out to me by email if you would like to explore the possibility of doing online MBCT with me. Thank you. Mindfulness-Based Cognitive Therapy combines two proven techniques for dealing with mental illness: the ancient practice of mindfulness and modern cognitive behavioral therapy (CBT). Mindfulness is the ability to become aware of your physical, mental and emotional state—in a non-reactive way. Through mindfulness, we develop the ability to see our reactions clearly—acknowledging the tendency to create story lines around our (and others’) behavior. Most of us can connect with the ‘should’ve / would’ve / could’ve’ that we carry throughout the day. With mindfulness, we learn to see the underlying causes of our challenges. Mindfulness therapy is an effective and safe way to find wellness in your life. Of course, when dealing with ongoing mental illness, it’s best to work with an experienced and knowledgeable psychotherapist. CBT uses tools and techniques to look at the unhelpful self-talk that traps us in negative thinking. Through CBT, you learn to be reasonable and recognize when you’re being too hard on yourself. In other words, CBT helps you to change your relationship with your thoughts and feelings. Mindfulness-Based Cognitive Therapy unites the non-reactive skills learned through mindfulness and then applies that to the ways we talk to ourselves about our challenging experiences. MBCT was developed by Zindel Segal, Mark Williams and John Teasdale. It arose out of Mindfulness-Based Stress Reduction (MBSR), pioneered by John Kabat-Zin. Since then, it’s been gaining a reputation as an effective treatment model. Online Mindfulness-Based Cognitive Therapy is essential to my online mindfulness therapy practice. I use MBCT to help clients with many different mental heath challenges, like depression, OCD and PTSD. Depression: more than being sad. According to the National Institute of Mental Health, depression is one of the most common mental illnesses in the US. The World Health Organization states depression as the leading cause of disability, world-wide…more than 300 million people. Depression is characterized by a feeling of heaviness, sadness and lack of motivation. We all feel like this sometimes, but when it persists for weeks, the depression is considered “clinical.” It’s more than being sad. Everybody is different. You or someone close to you may experience one or more of these symptoms. A recent study showed that MBCT helps patients with treatment-resistant depression. Study participants reported greater levels of remission, self-compassion, higher quality of life and much higher levels of mindfulness than those who didn’t go through the MBCT program. In my online mindfulness therapy practice, most patients see improvement within 3-4 sessions. Obsessive Compulsive Disorder (OCD) is characterized by repetitive and intrusive thoughts. These thoughts compel patients to repeat tasks whether the driving fears and beliefs are rational or reasonable. OCD can be mild to severe, but over 50% of sufferers experience severe symptoms, dramatically affecting their lives. Moderate symptoms are experienced by almost 35% of diagnosed people. MBCT helps patients to recognize the passing nature of thoughts, then gently adjust their behaviors. One study found that two-thirds of participants noticed a decrease in their OCD—being better able to release obsessive thinking and the compulsions that came with them. I use online Mindfulness-Based Cognitive Therapy in my psychotherapy practice to treat OCD. You can read about it here. Traumatic experiences happen all the time. Natural-disasters, combat, life-threatening accidents, sexual assault, random violence. PTSD happens when the traumatic event is re-lived. Stress triggers the fear, threat and/or shock of the original event. PTSD can happen to anyone—affecting 24.4 million people in the United States. Growing evidence and my own online mindfulness therapy practice have shown MBCT effectiveness with PTSD. In MBCT and Mindfulness Therapy, you learn how to create a safe and non-reactive relationship with traumatic memories and the associated emotions. It takes courage to face mental illness. Mental illness is nothing to be ashamed or afraid of. As we’ve seen, it’s common, varied and treatable. As a registered psychotherapist, I offer online mindfulness-based cognitive and online mindfulness therapy via Skype. Confidential, professional and mindful psychotherapy. But don’t just take my word for it. Read some of my client testimonials here. Let’s face your mental illness and find your mental wellness. Let’s get you back to enjoying your life. 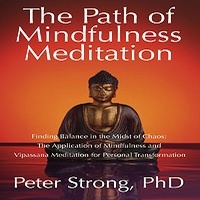 Peter Strong, PhDis a Professional Psychotherapist and specialist in Mindfulness Therapy. He offers Online Therapy via Skype for Anxiety, Depression & Emotional Stress.